Most of us don’t try to figure out what makes curriculum vitae distinct from resume. Perhaps we are not bothered about it, or we don’t go deep into things. Majority of us are still baffled what is the main difference between curriculum vitae and resume? The major distinction between both of them actually lies in their length. Resume is all about your skills, forte and your work experiences which usually consist of one or two pages. It is always compact but short and brief. Whereas a curriculum vita is somewhat different, it is more of length and detailed summary is mentioned in it. It encompasses different elements including education, academics, research work, work know-hows, honors and other details of such sort. A job seeker should always have his resume at his disposal. He can’t do without his resume/curriculum vitae, as it is a preliminary aspect to get into a new job. Resume always speak about yourself, what potentials you possess, what experiences you have in the respective field, your excellence is abruptly snuffed from your resume. So the more aptly you pen down your aptitudes, more chances you can avail yourself for a new job. Employers see the accuracy and smartness. So these are the things you should not overlook while designing a resume. In order to provide you a guideline about how a resume should look, today I am unleashing a free resume template for graphic designers. You can alter it as per your requirements. Previously, i posted Simple Resume Examples, do check out and get some inspiration as well. 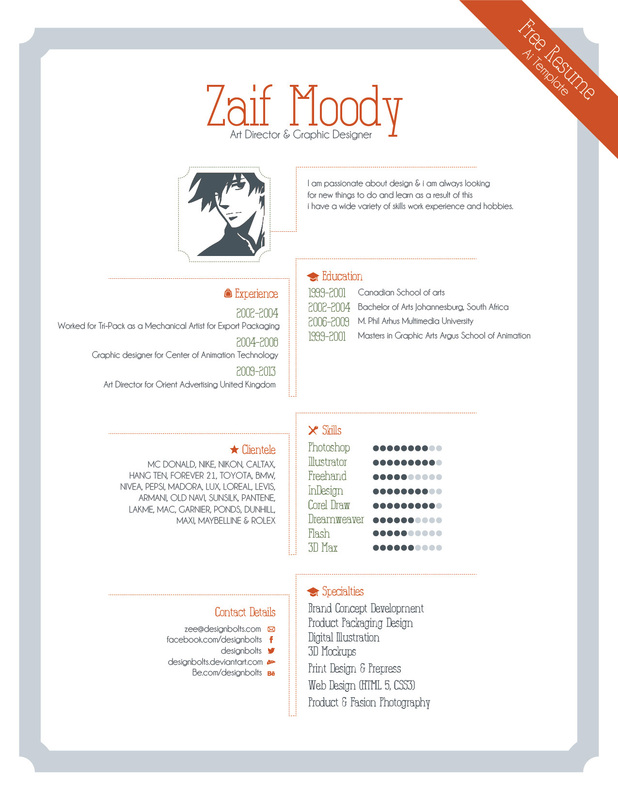 This free resume template is available in Illustrator Ai & EPS format.